travel: whistler | eat. drink. fly. last weekend we celebrated my husband’s birthday up in whistler. 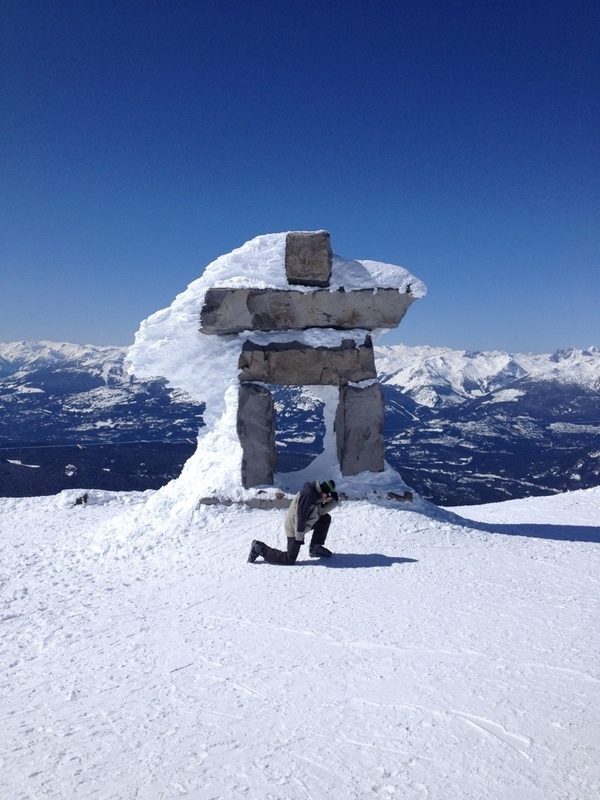 i absolutely adore whistler… and he has been dying to ski, so it was a perfect fit. the two of us, my brother and my husband’s best friend packed up and spent 2 nights in a winter wonderland. we stayed at the delta whistler village suites this time… for no other reason than they gave us a 2 bedroom unit for a very reasonable price considering it was peak season. the last time we were in whistler, we were at the pan pacific whistler village, which i absolutely loved. the location and the rooms were just a bit better than the delta, but i would definitely still stay at the delta again. usually though, the bulk of my whistler stays are done at the club intrawest in the upper village, which i also like. of course, being in the village proper is the best scenario, but i really do love the intrawest property. particularly the hot tubs and pool area. anyways. unfortunately for us, my husband was just getting over a wicked cold and i was just getting it. so the party factor was a lot smaller than we thought it would be. so what was projected to be a wild weekend, turned out to be pretty tame, but still super enjoyable. i had an appetizer of fried goat cheese with rosemary honey that nearly brought me to my knees. spectacular. the service was a little spotty… really great until this massive group of people showed up and didn’t have seats, so they were literally hanging over us on all sides while we were eating our meal. they totally obscured us from the waitress, so it took over 30 minutes to get our drinks refilled and it just made us feel like we wanted to get out of there as soon as we could. it was a shame because up until then, we were having a really lovely time… i have no idea what the hostess was doing or why you would bring that many people upstairs with nowhere to seat them. saturday morning, we were up early and i made the boys breakfast before they hit the slopes. i love having a kitchen in a hotel room. it really makes your stay so much cheaper the have snacks and light meals on deck. then they were off as soon as the mountain opened. i decided to hit the gym to try to sweat out my sickness and then i relaxed in the pool and hot tub. i love how whistler pools are like bathtub temperature… and then got ready for some village exploring. my original plan was to hit the trails like i normally do in whistler… but then i realized that i’m normally not there during ski season and most of my regular trails are closed for cross country skiing. so i gave up on trying to navigate the map and just explored the village. the weather was stunning. absolutely picture perfect whistler weather. not a cloud in the sky and warm sunshine… no wind at all. lovely. my first stop was david’s tea, where i had the most excellent cup of cold 911 tea to help ease my sickness. it worked like a charm… while i was drinking it. but then it snuck back up on me. by noon i was ready for a bowl of soup. i read the menus at a few places and eventually decided on the little eatery, as they had a selection of 6 different soups. i ordered a bowl of the thai chicken, which was spicy and exactly what i needed. very yummy. unfortunately, i found the service to be a little lacking. i was left at the entry way for a while and ignored and was just about to leave when finally someone talked to me and seated me. then my order was taken, dropped off and later my bill brought. i definitely felt a little neglected by the “bare minimum” service i received. while it technically wasn’t “bad” service, it just didn’t make me feel like they cared at all about my business or experience. but i’m sensitive to that sort of thing. after my soup i had to retreat back to the hotel… the sickness was creeping up on me and despite the phenomenal weather, i just couldn’t hold it together anymore. around 4pm the boys came back and we hung out in the room all night… watched 2 hockey games, drank some drinks… i made chicken wings and lasagna (thanks costco) and we just talked and laughed and had a great time. the next morning we hit up the dub linh gate pub for breakfast. i had a gift certificate for $50, so it seemed like a good time to use it. the breakfast was super average. my husband’s smoked salmon benny was good, but my omelet was pretty much inedible with leathery eggs out of the carton. they also served the breakfast french fry. which i’m not really a fan of. if you call it a hashbrown on the menu, it should be hashbrowns, not cubed french fries. but the service was really good and the irish coffee very irish, so i give it an overall “okay” stamp. probably a better place for lunch/dinner or just drinks. so that, my friend, was my whistler adventure. and now, i leave you with the greatest picture anyone in my family has ever taken. my brother on top of the mountain, tebow-ing. hahaha, your brother tebowing at the end of this article just made it! it was really the highlight of the weekend for me.